Being an author wasn’t L. Phillips Carlson’s first choice of profession, but once the writing bug finally hit, she published over 130 articles, short stories, and poems. 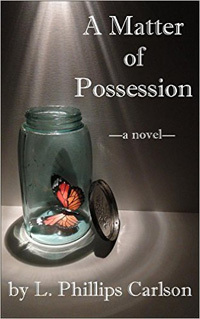 Her debut novel, A Matter of Possession (Snowsnake Press, 2014), was the winner in the science fiction/fantasy category of the 2015 New Mexico-Arizona Book Awards. 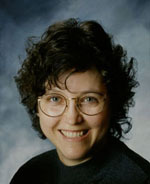 You can find Ms. Carlson on her Amazon author page and her website at LPhillipsCarlson.com. What is your elevator pitch for A Matter of Possession? New P.I. Joe Shurjack investigates a rich woman’s murder and the theft of a rare butterfly collection while hampered by the ghost of his flirtatious co-worker. This book is a paranormal mystery, which involved planting clues throughout the story. So I tried plotting backwards from the ending to the beginning. Then I found it hard to stick to the outline, since new possibilities always crop up as one writes. I did manage to stick to the basic plot, but barely! What is it about your main protagonist that makes readers connect with him? Joe is an average guy who has a crappy boss and a lackluster marriage. He’s really at a crossroads in life, and has been put down enough to not have a lot of confidence in himself. Yet he’s plucky and manages to forge ahead anyway. He makes mistakes but is persistent, a quality that helps him greatly. Why did you decide to use St. Louis as the setting for the book? I’d visited St. Louis numerous times while my daughter was in Washington University’s medical school, and found the area to have a variety of interesting settings. Both St. Louis and Albuquerque figure prominently in my story. Joe visits Albuquerque on a shaky but profitable lead, with wife Teri in tow. Being a transplanted Midwesterner myself, I could relate his culture shock with humor and real-life experience. Besides all of them? One of my favorites is when Joe encounters the ghost in his kitchen. I also like the revealing scenes in the eclectic City Museum (actual place) and the Lotus Moon Antiques store (made-up, but partially based on a moon-themed hotel in University City). Tell us how the book came together: where the story idea came from, how long it took to write, editing cycle, etc. I’m not sure where some of it came from, honestly. I usually combine several ideas for my stories. It’s the way my mind works, and I blame it on my Czech heritage. I can usually find inspiration in settings, which was the case with this story. St. Louis has the fabulous Forest Park, for instance, which is twice as large as New York’s Central Park and contains museums, zoo, skating rink, paddle boats and more. I also like to deal with real issues like relationships, work, and other life problems. I write in spurts, and then things lie fallow forever, so it’s hard to say how long it took to complete the novel. It probably only took a half-hour or an hour per page, editing included, but spread out over a couple of years. My rough drafts aren’t so rough anymore. I tend to self-edit as I go, usually in several chapter chunks to keep consistency. So the final draft only needs some clean-up and proofing. I trade critique and editing services with several people, who are both writers and editors themselves, so I end up with a polished project. I met them all at SouthWest Writers (SWW), by the way. What makes A Matter of Possession unique in the paranormal market? It’s a short novel—the print version is 165 pages—so it’s a quick read, popular with today’s rushed lifestyle. Several readers have told me they read it in a single sitting! I like to think A Matter of Possession is quirky, fun, and adventurous, but that’s up to the judgment of the reader. Why did you decide to start Snowsnake Press and take the indie route to publishing? I’ve had several short pieces published with traditional magazines, so I’ve done the submit-and-wait routine. With the tremendous flux in publishing today, writers have choices, and it only makes sense to consider both legacy (traditional) and indie publishing to determine what’s best for your particular project. I went indie because there are a lot of bad deals out there right now, and I’m trying to avoid them. You’re on your own much of the time, in either path to being published. And there’s no shortage of companies who will take your money and do nothing for you. I found that it’s not easier to go the independent route. It may even be harder. So far, after writing and editing the best story I can, I’ve concentrated on the product: formatting ebooks and trade paperbacks, doing art and covers, comparing print services, learning about copyrights, ISBNs, and passive marketing (blurbs, website, Facebook, search terms, etc.). Next up, I’m going to study more advanced marketing. There’s so much to learn! Why did you decide to use a pen name? I googled myself and found several prolific writers with the same name as mine and my info was nowhere to be found. So, for SEO (search engine optimization) I combined my first initial, maiden name and married name—which usually don’t go together—and now my work pops up on the first page. I’m told that it’s useful to have different pen names if you write different genres, especially if they are not compatible (like Christian and Erotica). It makes it easier for readers to find what they like. I’m not out of my comfort zone on that yet, so I’ll keep L. Phillips Carlson for my newer work, at least for now. My daughter started writing as a youngster and actually got published before I did. She won a contest in grade school and we went to an awards ceremony with Madge Harrah (from SWW) as speaker. Madge was wonderfully sweet and genuine, with a real affinity for kids. Maybe some of you remember her. She told the kids that if they wanted to write, they could certainly become writers. As I listened to her inspired talk, I was caught up, too. Don’t copy me—I’m a bad example. My writing routine is abysmal! I need large chunks of time to write and I get distracted easily. My extended family is demanding, and I often go weeks without putting a word on paper. I also travel a lot. But you know? It’s okay. I’m living life and that all becomes fodder for stories at some point. What is the best encouragement you’ve received in your writing journey? What advice do you have for discouraged writers? When someone tells me that my story has touched them, made them feel better, or gave them a good laugh, then it makes me feel like I’ve really communicated! Getting an award or two is a great atta girl, as well—A Matter of Possession won top honors in the 2015 New Mexico-Arizona Book Awards in the science fiction and fantasy category. We all get discouraged. Writing is hard, or anyone could do it. Writing well takes time, like learning to play the piano. You can plunk out a tune early on, but to make it sound like music takes a lot of practice. Try to be patient with yourself while you’re learning. One thing that has kept me going is to examine my goals. Very few people become bestselling authors. Even though I’ve made a few foreign sales, and people in half a dozen countries have read my work, I don’t think of myself as having “made it.” Maybe I’ll end up selling mostly to friends and family, but I love the process of writing and that’s what counts. If it isn’t fun, don’t do it. I’m writing a series of connected short stories set in the 1920s, right after King Tut’s tomb was discovered. It will, of course, involve paranormal aspects—I’ve got a ghost running amok again! My working title is The Pharaoh Rests Lightly. I also have a sequel started for A Matter of Possession, and I’m planning to resurrect a sci-fi novel I wrote years ago that has promise but needs a thorough scrubbing. In addition, I hope to do more with my website: http://lphillipscarlson.com. I’ll be getting my email sign-up in order soon and will actually get going on the blog there. I have a number of topics in mind for the blog, but I’m leaning toward some of the odd things that I’ve encountered while travelling.